It was in the early morning hours of September 5, 1891, when the bizarre creature was seen. The first witnesses to talk to the local paper were two ice men, Marshall McIntyre and Bill Gray, who were loading their truck for their morning rounds at about 2 AM in the morning. They saw the thing as it approached the town of Crawfordsville, Indiana, USA, in the sky from the west. 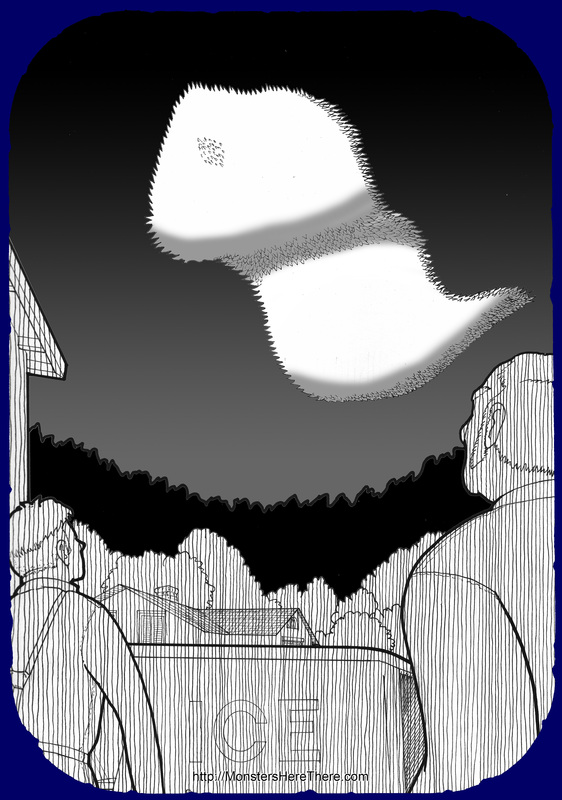 It was 300 to 400 feet up in the air, and looked vaguely like a great white shroud about 18 feet long and 8 feet wide, fluttering and rippling as it swam through the air towards the town. The men also said they had seen a single, great red eye, and that the strange mass occasionally emitted an eerie cry. The object started to circle the farm high in the air and, after about an hour of watching it, the two men left on their rounds... it was gone by the time they returned after daybreak. The local Crawfordsville newspaper, the Daily Journal, ran the story of the sighting the same day, and they soon heard from other people who had seen the bizarre creature that night, most notably the Rev. G.W. Switzer. Switzer and his wife had seen the flying thing when he stepped out to his well to get a drink a little after midnight. They watched the thing as it twisted and squirmed in the air; they saw it descend towards a neighbor's yard as if to land, where it disappeared from view. As Switzer walked out to the street to go look in the neighbor's yard, the object once again took to the air. After watching the object for some time, the Switzers retired to bed. The general reactions of the newspaper's readers ranged from wondering if the thing was a ghost to those wondering how drunk the 'witnesses' were. There were just two more witnesses to the 'monster,' and they turned out to be very important witnesses. John Hornbeck and Abe Hernley had spotted the thing the same night, and set out to follow it everywhere it went. They came close a few times to catching it on the ground, but then finally got a good look as the 'monster' swept down from the sky close to the ground near the men... it was a flock of birds. Killdeers, to be precise; a dird that has a mostly white underbelly, and a red spot on the back of their tails. While this killed the story of the monster in Crawfordsville itself, unfortunately the earlier articles from the Daily Journal were picked up and given national display... but not the article that explained away the monster. Because of this, and of the inclusion of the initial reports in a popular book on weird stuff published forty years later, many people continued to tell the story of the "Crawfordsville Monster" for nearly a hundred years after the flock of birds were mistakenly labeled such; it was only when the original reports became available on the internet that, for the most part, the story finally died off.